I’ve unofficially begun my quest for outdoor activity as opposed to gym confinement. For those of you who haven’t read, you can check out my 2013 goals here. Basically, these are the ten goals I choose to accomplish this year. Over the course of the next 11 months, I’ll provide updates to you randomly in blog posts. So tune in often! So prior to my outdoor ventures, I was a gym-rat; specifically, I was glued to the weight room often times bypassing the cardio machines to hungrily hurry towards the barbells and free-weights. I’ve put on a great deal of muscle in the last few months because of this. Now, I am changing my actions and implementing more outdoor running, walking and hiking to build my endurance. I’m training for my second half marathon in June — another one of my goals! Running can be hard on the knees and joints and so I’ve been purposely eating more omega-3 rich fish for the anti-inflammatory properties and its effectiveness in reducing exercise-induced soreness, therefore improving recovery time. Salmon is a fatty fish that offers about 2 grams of omega-3 fats in a 5 ounce serving. It is recommended to eat 2-3 servings of fish per week to ensure you are balancing omega 3s with inflammatory omega-6s. Inflammatory omega-6 fats are found mostly in plant oils and fried foods prepared using rancid plant oils such as soybean, canola, corn, cottenseed, vegetable and safflower. Health issues such as PMS, cramps, joint pain, obesity, diabetes, sports recovery, high cholesterol, depression and anxiety can all be eased by reducing intake of omega-6 while increasing omega-3 fats. Eating fish, taking fish oil supplements, and cooking with healthy fats such as coconut oil, olive oil, animal fats (grass-fed), and pastured butter are all ways to improve your body’s omega-6 to omega-3 ratio which ideally should be 3:1 or better. Due to the Standard American Diet (SAD), that number is more like 20:1 for the (less than) average American. 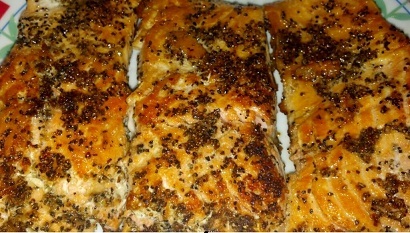 Improve your ratio today with this yummy salmon recipe. 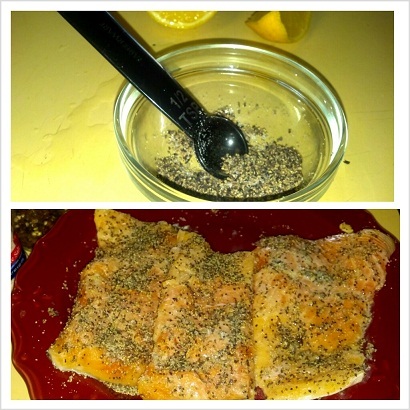 You will love this lemon pepper crusted salmon: full of bold and bright flavor from the lemon and black pepper. You can choose to remove the skin from the salmon but personally I keep the skin on because it adds a bit of crunch from frying it in the coconut oil. 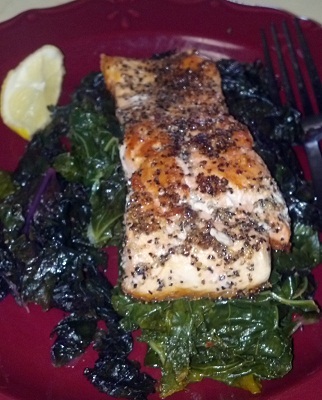 Serve the salmon with a side of greens of your choice. 1. Rinse salmon then pat dry. 2. 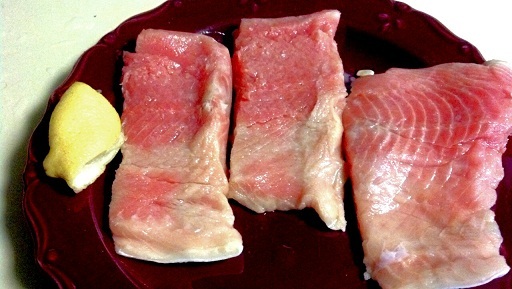 Squeeze juice of 2 lemon wedges onto both sides of salmon. 3. 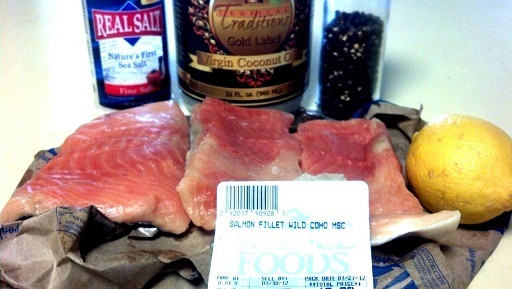 Mix salt and pepper in small bowl then sprinkle liberally onto salmon making sure to coat evenly on both sides. 4. Heat oil in pan. 5. 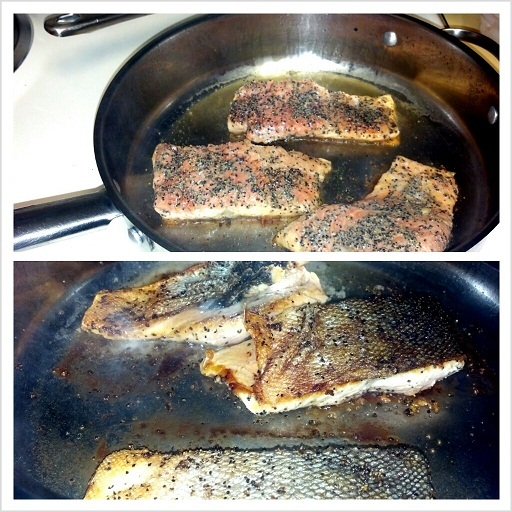 Pan fry salmon for 3 minutes. Flip and fry 3 more minutes. 6. Plate salmon and squeeze juice of 1 lemon wedge onto salmon (skinless side). “You’ve got that glow, girl!” Aww thanks, I reply with humility. Everyone who tolerates fish should make salmon and other fatty fish such as sardines, canned mackeral and tuna a part of their weekly meal menu. Fish is a rich source of Omega-3 essential fatty acids which is a potent anti-inflammatory. It is vital to get omega-3s in your diet because the body cannot manufacture it in the body: it obtains the omega-3s externally through the food you eat. Get rid of scaly skin and dryness by increasing your intake of fish. Omega-3s keeps the body hydrated and keeps the skin from flaking and drying out. Start with 2-3 servings a week. For those of you who do not eat fish, supplement with high quality fish oil to achieve similar benefits. For non-fishy sources of omega-3s try pastured raised grass-fed beef (the commercial variety is full of inflammatory omega-6s), omega-3 enriched eggs and walnuts. Lemon, limes, oranges, grapefruit are chock-full of vitamin C – a powerful antioxidant that fights inflammation and slows the action of free radicals in the body which can contribute to wrinkles, dryness and fine lines. You may feel sour at the thought of biting into a lemon, but this fruit is amazing for bringing out the flavor in foods. Squeeze into sauteed greens to reduce bitterness, add in marinades to improve the tenderness of meats. Also, lemon takes away that metallic taste often characteristic of tap water. So the next time you are at a restaurant, ask your waiter for a few wedges of lemon to go with your water. Other rich sources of vitamin C include broccoli, tomatoes, bell pepper and peaches. Avocados are truly amazing, alligator skin and all. With such raving reviews, it is no wonder avocados are wonderful for skin health. The fruit has even been patented for treatment for dermatitis and arthritis — not surprising since it is full of fat soluble vitamins A, D, and E to help promote healthy skin. The cosmetic industry has capitalized on the value of avocado with the influx of products such as avocado oils, creams, and facial masks. Save your money by simply eating the fruit. 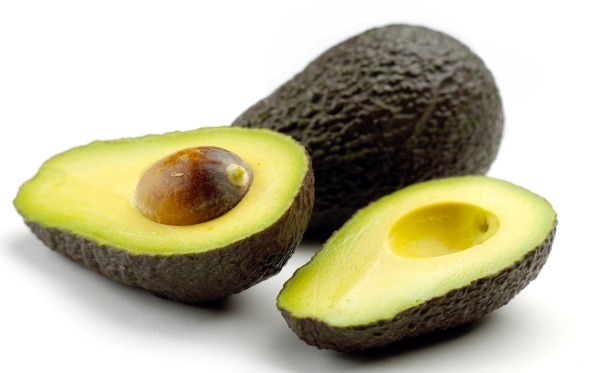 You can even make your own nourishing avocado facial mask to soften and soothe skin. Pumpkin seeds are a good source of zinc: a mineral that plays a role in over 200 metabolic processes in the body! yogurt. You can even add ground pumpkin seeds into the ground beef mix the next time you make hamburgers. The kids won’t even know its in there! Other foods rich in zinc include fresh oysters, ginger, pecans, Brazil nuts, and eggs. Who doesn’t love a sweet potato roasted in the oven? I swear they taste like candy when you make them this way — without any added sugar. 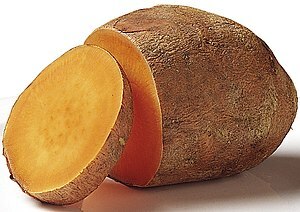 Sweet potatoes –or yams — are rich in vitamin A which is important for skin repair and maintenance. Deficiencies can result in dry, flaky skin. It is always best to get your vitamin A through foods as opposed to supplementation so try various foods including liver (one serving of liver per week is all you need! ), collard greens, chili peppers, dandelion, kale, spinach and cantaloupe. You can eat as much of these foods above without seeing much improvement in your skin health if you do not drink enough water. For young looking, healthy skin, drink water so that your body can clear out impurities, rejuvenate skin cells, and absorb nutrients. Many doctors recommend 8 cups of water daily. You may need to drink more (or less) depending on various factors. Cheers to beautiful, healthy skin! What foods do you eat to keep your skin healthy. Share in the comments.